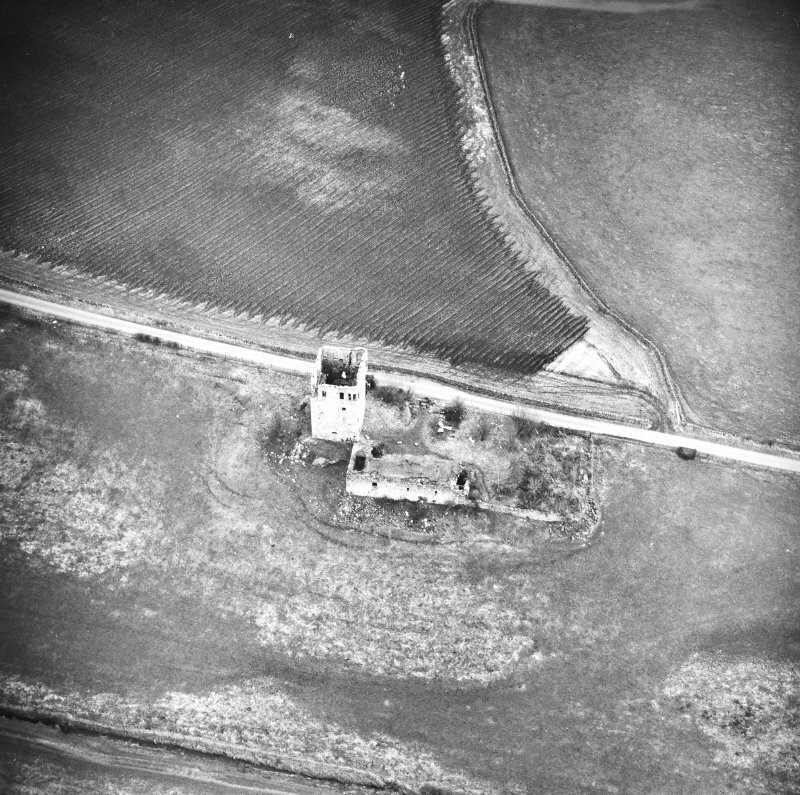 Oblique aerial view of Plean Tower, taken from the SE. 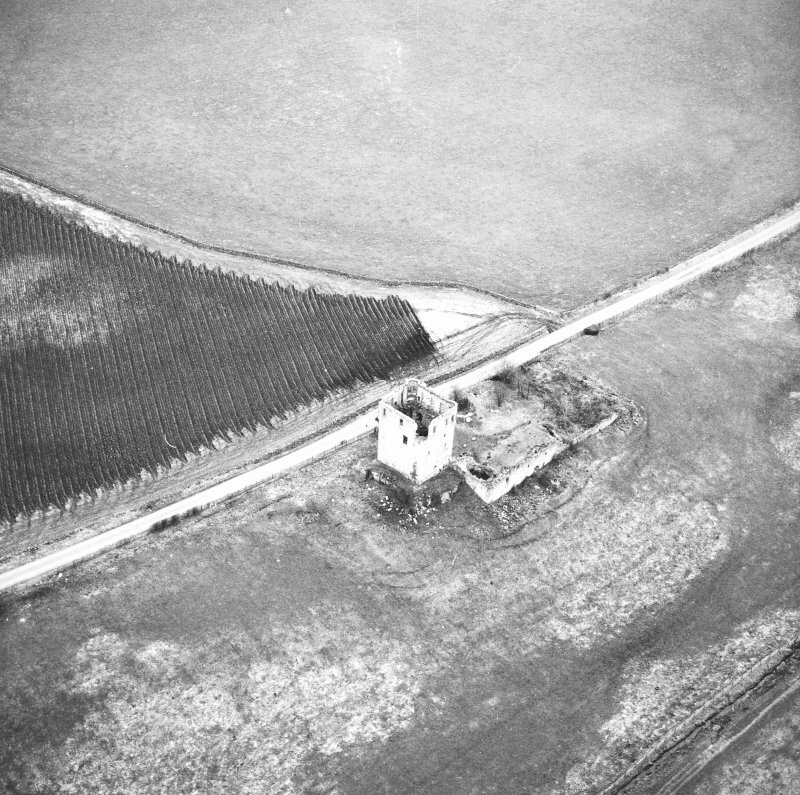 Oblique aerial view of the cropmarks of the rig and furrow and pits with Plean Tower in the background, taken from the NNE. 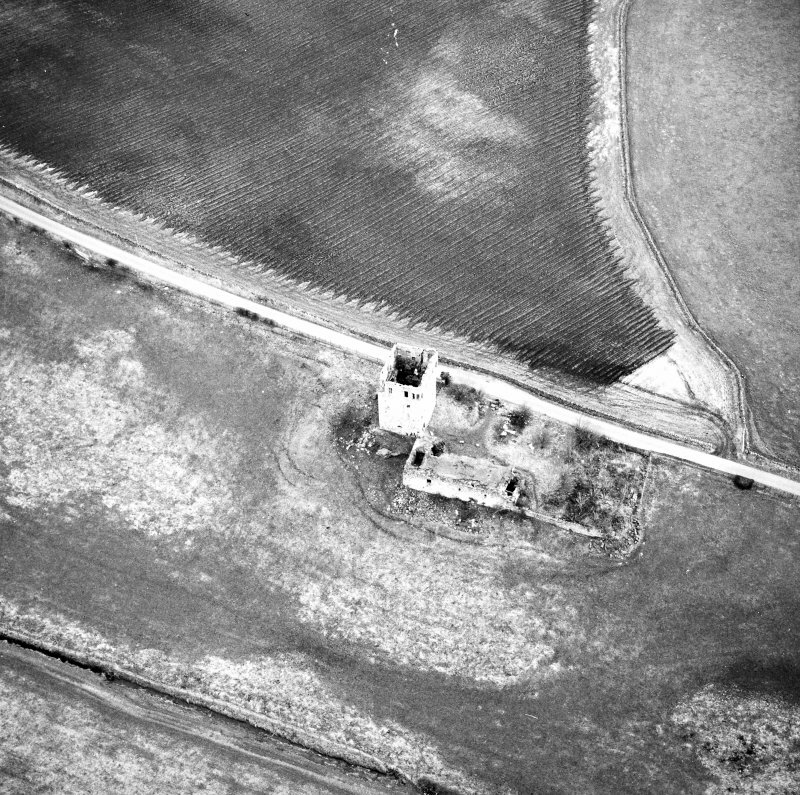 Oblique aerial view of Plean Tower, taken from the S.
Drawing of Plean Mill Tower. 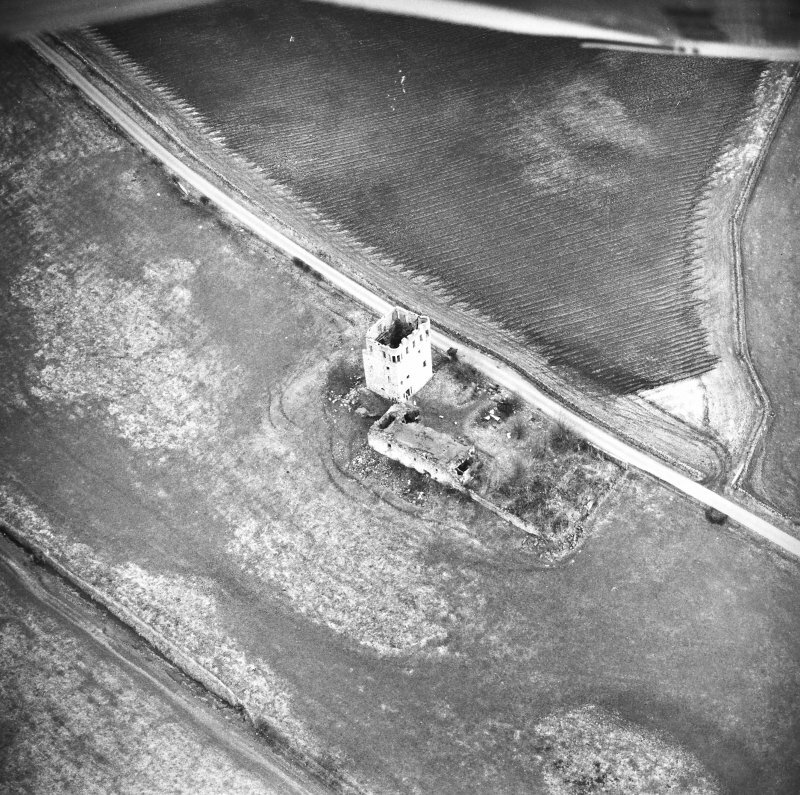 Oblique aerial view of Plean Tower, taken from the SW.
Oblique aerial view of Plean Tower, taken from the WSW. 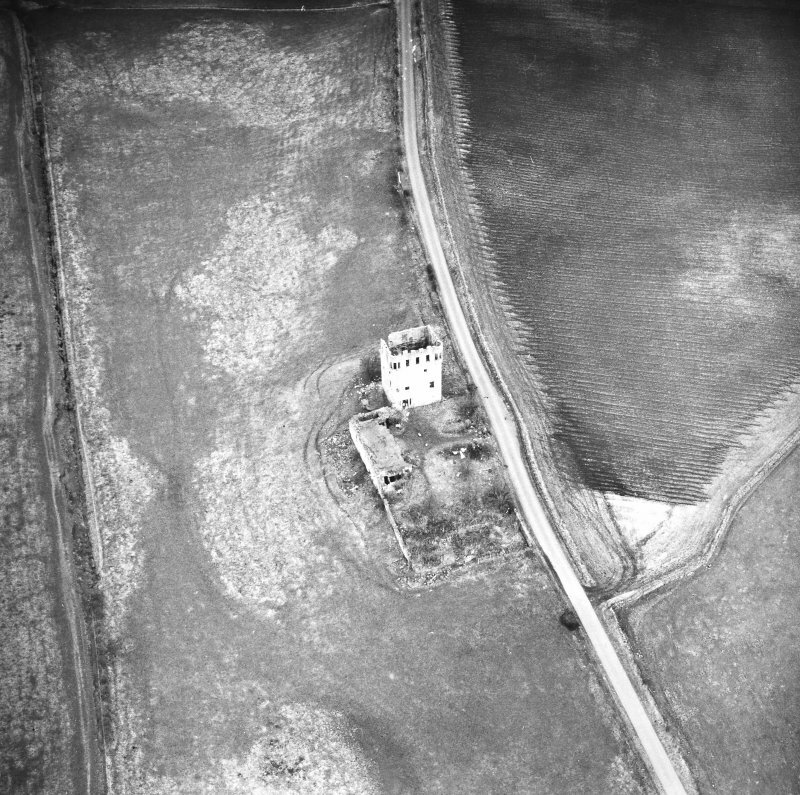 Oblique aerial view of Plean Tower, taken from the W.
Oblique aerial view of Plean Tower, taken from the NW. 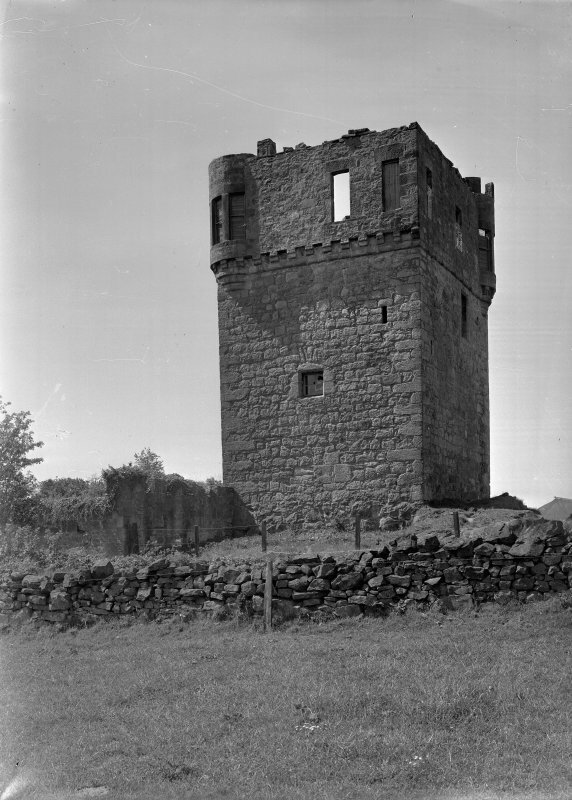 Plean Tower is the most prominent feature of a group of buildings sometimes known as Menzies Castle (Plean Castle on OS 6" plan). It is a small rectangular tower-house, built in the second half of the 15th c. During the following century, a courtyard was added to the S of the tower, but of this only a few fragments of walling survive, together with the range of buildings that formed its W side. 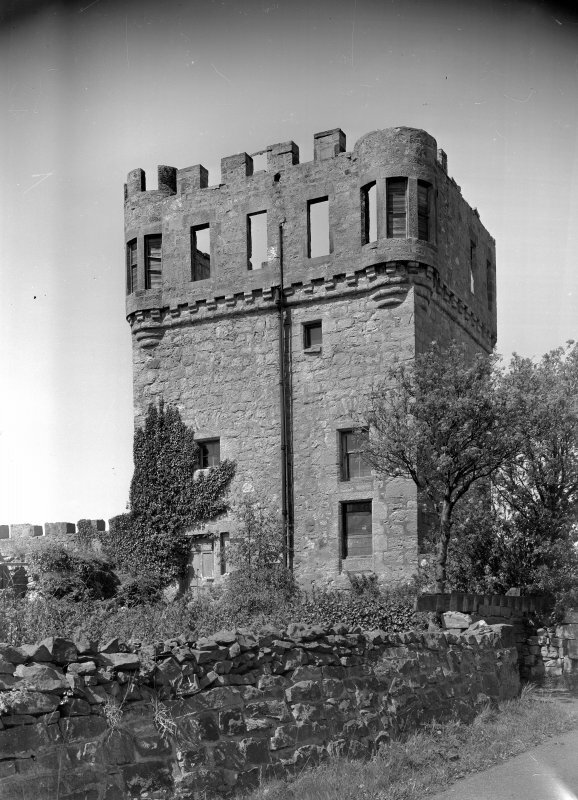 Though ruined by the end of the 19th century, shortly afterwards, the tower was extensively restored, raised a storey in height, and made habitable. 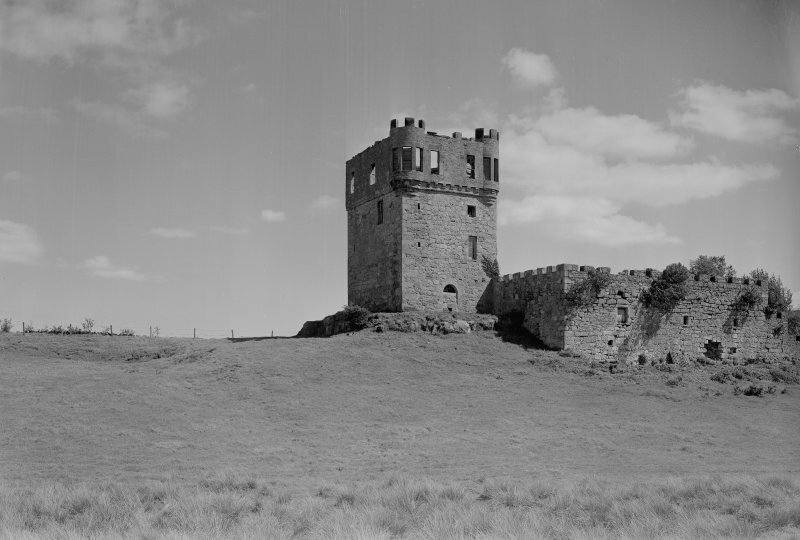 The uppermost parapet today gives the tower the appearance of a folly. 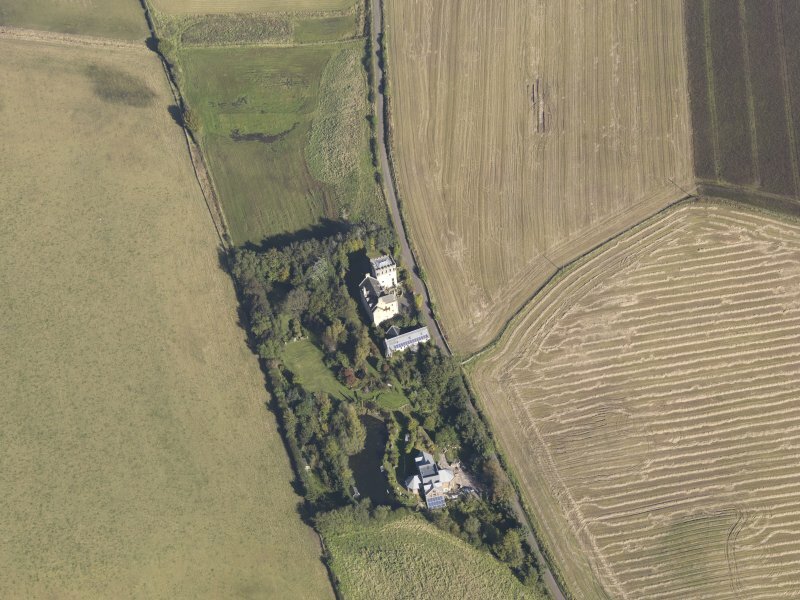 Though only the lowest storey of the W range survives, originally it rose to at least two storeys. 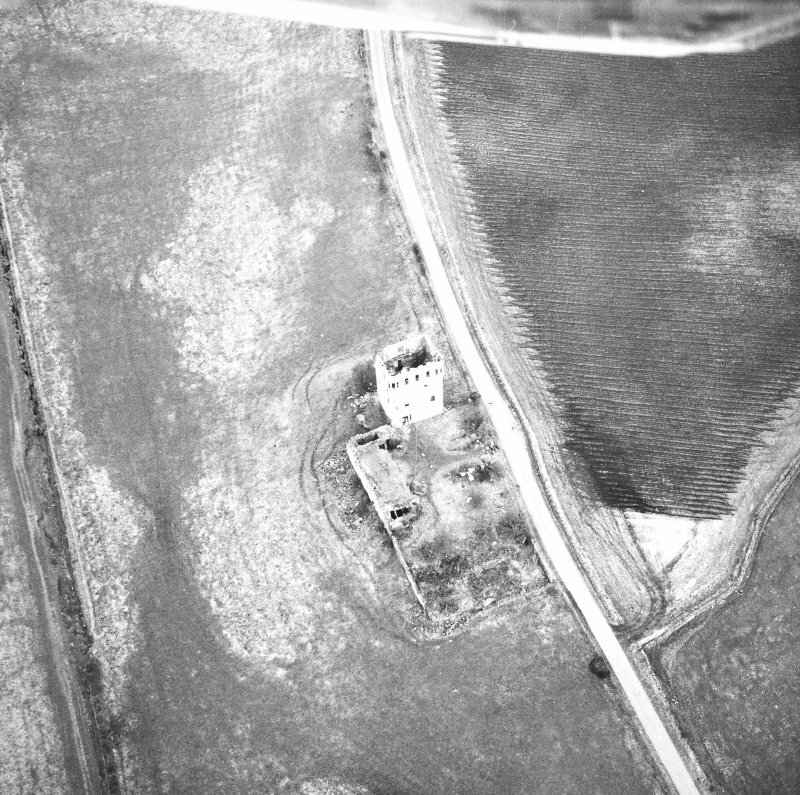 None of the buildings is inhabited today, but some are used for storage. 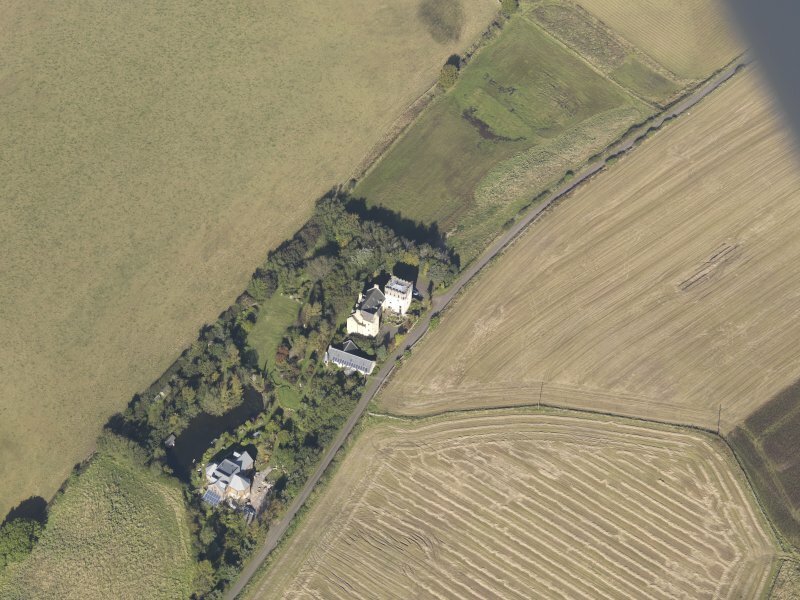 The tower and outbuildings are generally as described. 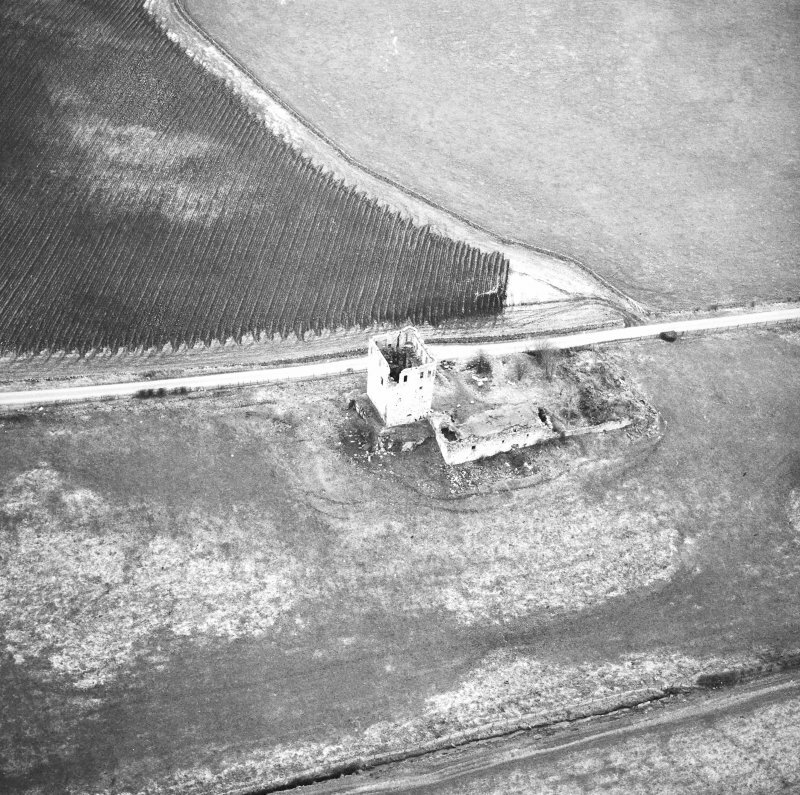 A small excavation was carried out in April 1992 and a watching brief was undertaken throughout the course of the year monitoring the restoration of the tower and repairs to the W range. 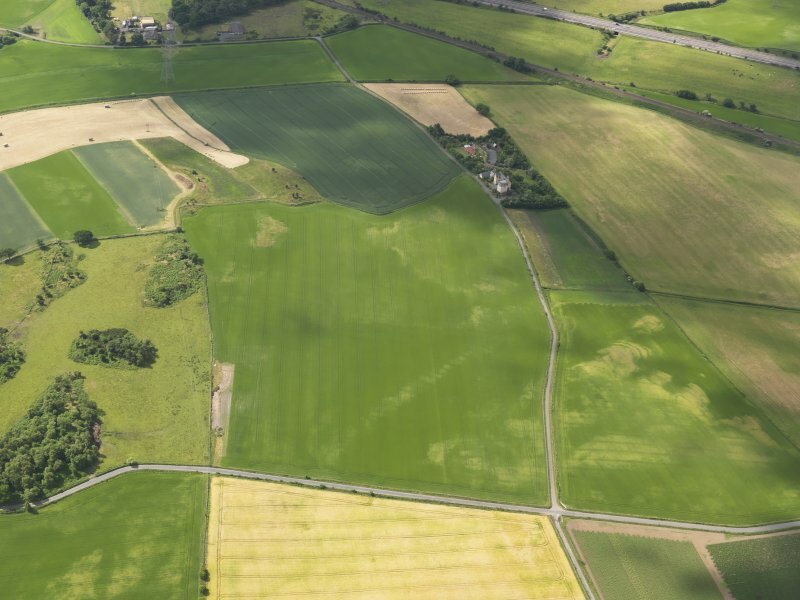 The work was carried out by the author and members of the Glasgow Archaeology Society and ACFA. 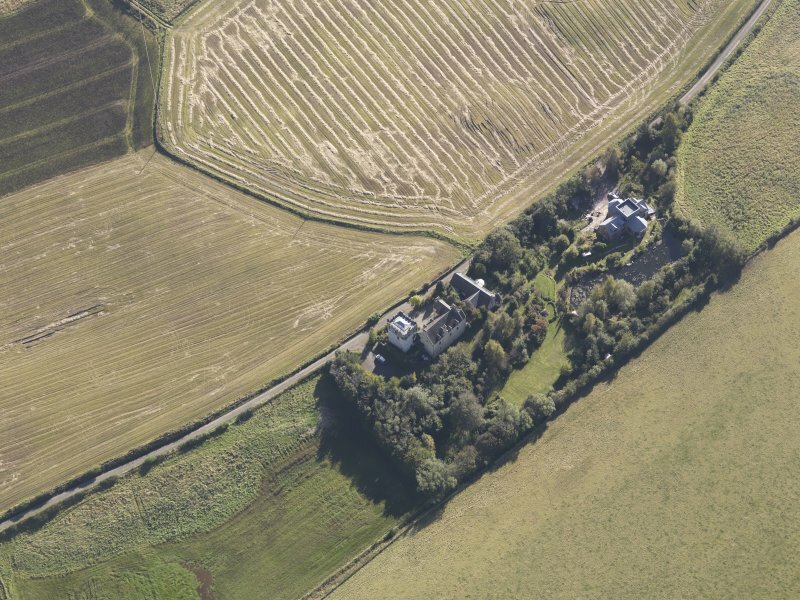 The excavation concentrated on the courtyard and the passageway of the W range with additional trial trenches both within and outwith the W range. 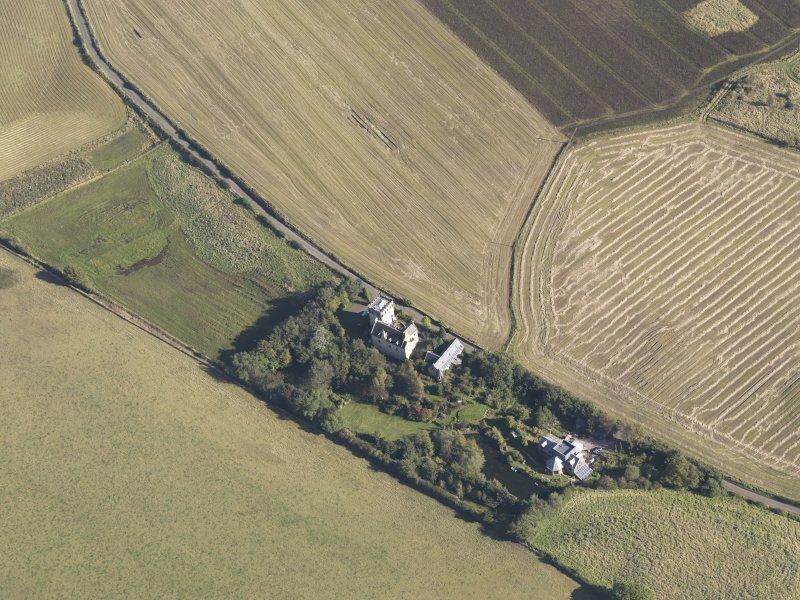 The trench was largely bedrock with a thin covering of mixed topsoil. 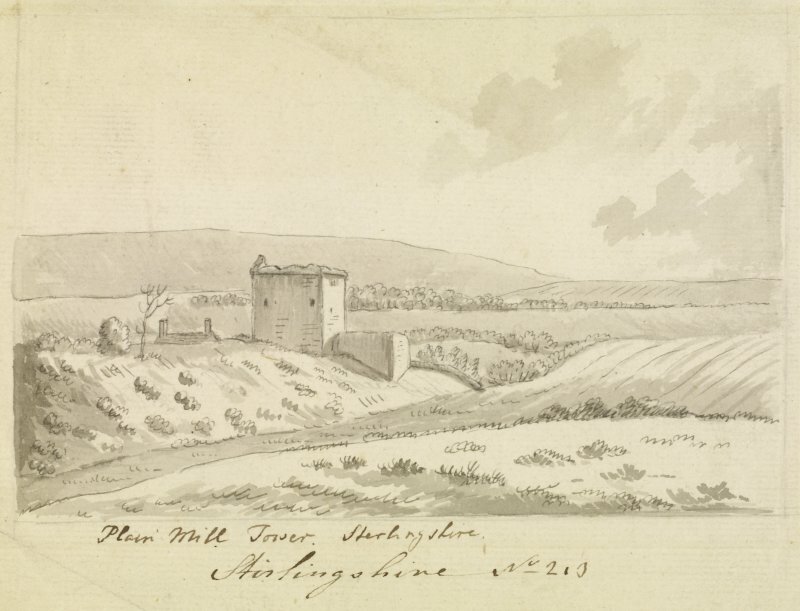 The passage linking the two vaults and the kitchen of the W range was uncovered and proved to be cut into the bedrock with a pronounced step some 0.35m deep, the outer wall where it survived at the N end consisted of a thin skin covering the bedrock. The passageway was filled with modern disturbed material probably the result of the extensive renovations that were undertaken between 1908-11. 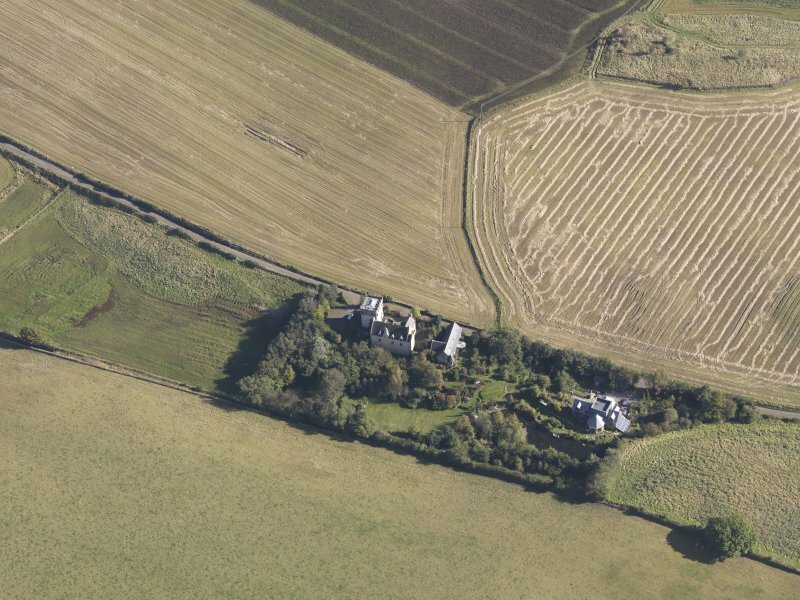 At the base of this material several sherds of late medieval Reduced Green Glaze pottery were recovered suggesting that this was undisturbed. 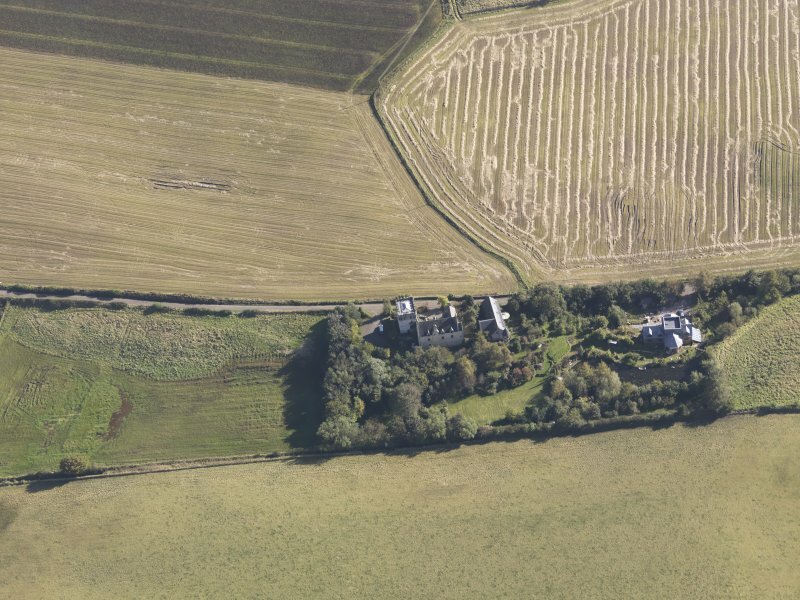 This consisted of mortar foundations for a possible flagstone floor, the foundations of the outer wall also survived. At the S end of this passage the foundations of a small building were uncovered, possibly a stair tower leading to the upper floors of the W range. Unfortunately this only survived as a foundation base with no internal architectural features. The various trial trenches within the vaults revealed that the floors had been removed leaving the rubble core of the foundations. The trench outwith the W range uncovered a large Victorian midden containing clay pipes, pottery and various glass bottles.